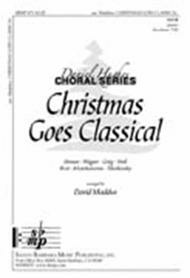 Anvil Chorus from "Il Trovatore"
Sabre Dance from "Gayane Ballet Suite"
Christmas Goes Classical composed by David Maddux. For SATB choir, piano. Daniel Hughes Choral Series. Christmas. Published by Santa Barbara Music Publishing (SB.SBMP-671).Borrowing from some of the most famous tunes in all of music literature, the arranger cleverly added a Christmas text giving us a unique and festive piece for the Christmas season. Mature voices recommended: perfect for the adult community choir. Hearing is believing this one--do listen to the excellent recording.